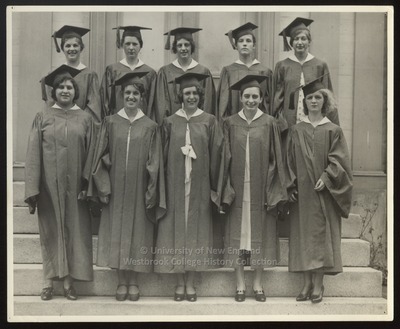 "Westbrook Seminary and Junior College, Class of 1930"
Ten members of Westbrook Seminary and Junior College, Class of 1930, stand on the steps of Alumni Hall in their Commencement caps and gowns in this 1930 black & white photograph. Graduates have white collars on their robes and wear white dresses under their robes. Shoes are dark to match the robes. Front row: Isabel Waxman, Katherine Lewis, Eleanor Hallen, Jane Hyde, Corris Hume. Back row: Harriet Dodge, Anne Cooper, Louise Learned, Sarah Braman, Ruth Wheeler.